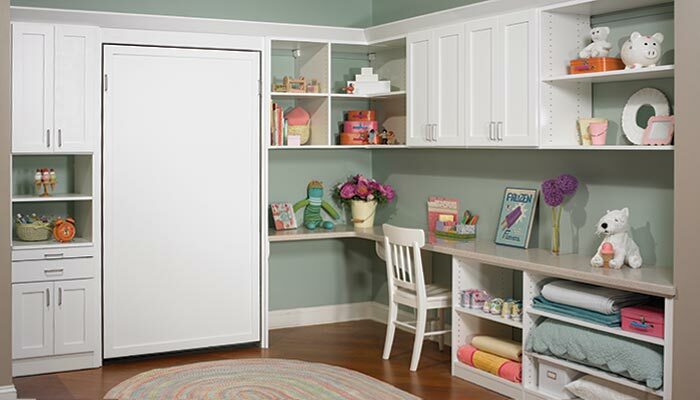 Good Organization & Study Habits Bring a Lifetime of Success: Add room for sleepovers with this Closet Works twin wall bed without taking up any precious floor space that could be used for studying or playing. The integrated wall unit and desk system work like a twin Murphy bed with desk, adding needed storage and a study area while using less space than a traditional separate bed, desk and dresser. Children have their own special needs for activities and organization. Developing good study habits and good organizational skills early on can make a definite difference in school performance that carries over into adulthood. Closet Works created this special space where separate areas are set aside for studying, sleeping and storage in order to address the special needs of our younger clients. Typical kid clutter doesn't stand a chance when everything is given its own place. Abundant storage to hold books for school and a myriad of chilhood treasures is available in the shelving and cabinets shown here. Separate space for weekend sleepovers with friends was considered and included through the addition of a twin size wall bed that remains closed during the school week, freeing up floor space that can be used for other activities. A corner el-shaped desk along one wall provides a perfect study environment — enough room to spread out books and projects in a clear and orderly manner. Open sheving under the desk keeps the most used items, like shoes, easily accessible for a small child — and easy to put away. 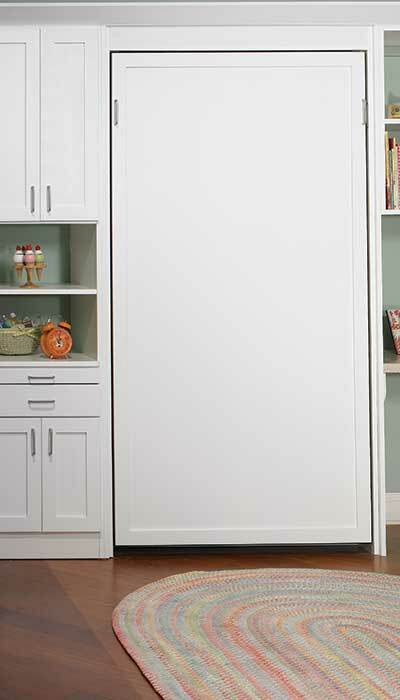 Having a built in desk and storage system allows for more total storage in less space than traditional furniture. The Closet Works wall bed system is perfect for Grandma and Grandpa's house, because you can include more sleeping space for occasional overnight visits by grandchildren, while keeping the floor space open most of the time for other activities.